When I worked in Corporate America back in the late 80’s and during the 90’s, I used to experience something that I don’t anymore… office birthdays. Every time there was a birthday in the department everyone brought something in. Didn’t matter if it was store bought or homemade, as long as you brought something. My manager always brought her spinach dip. Man it was so good! And those little cubes of bread? Heaven. I couldn’t wait for the next party! I’ve never been able to duplicate Elaine’s spinach dip recipe, and I’ve tried a few. Maybe someday I’ll find that special one. Until then I’ll keep experimenting and trying recipes that look good. 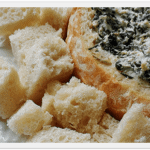 I found this spinach dip recipe on Sargento’s website. 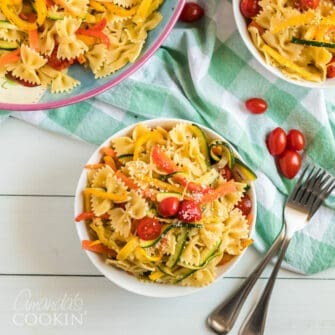 It’s a bit different than most I’ve seen, using light ricotta cheese and shredded parmesan cheese for a different kind of dip. 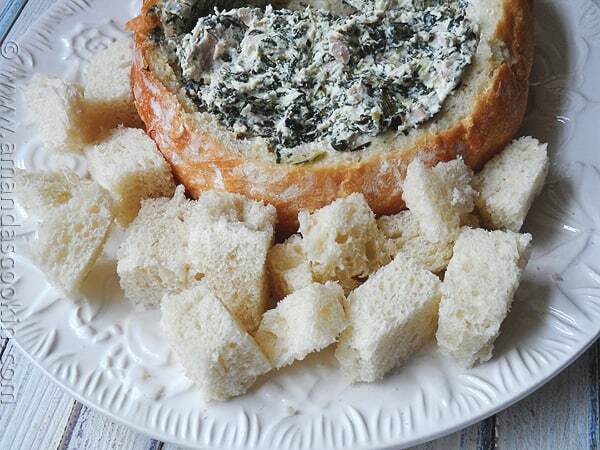 This dip is served warm and baked right inside the round bread, which I love! 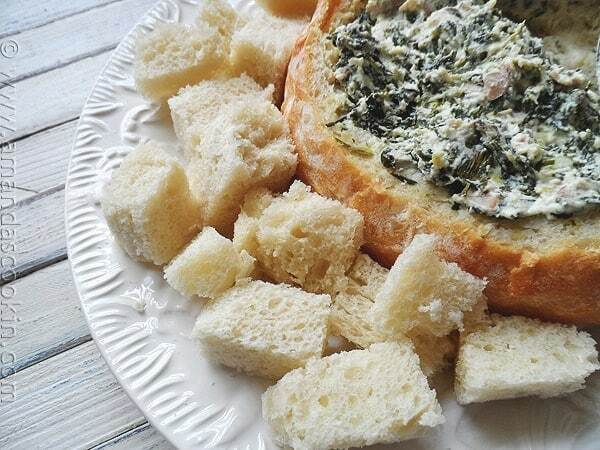 I have to say though, because my brain is programmed to know “spinach dip” as a certain flavor, mainly the kind my boss always made, this recipe was notably different. I think it was the name really, which is why I’m calling it Ricotta Spinach Dip. That way there are no surprises! I had a friend over and asked her to try it. I told her that it wasn’t what I was expecting, but at the same time strangely addictive! I couldn’t stop munching on it! Deana agreed with me and we both stood there in the kitchen talking and polishing off all those little bread cubes, leaving only crumbs. So if you’re looking for something a little different that you can’t stop eating, try this tasty hot dip. I just know you’ll love it! Combine Ricotta cheese and sour cream in food processor, blender or electric mixer; Process until smooth. Stir in spinach, ham, Parmesan cheese and green onions; set aside. Cut 1-inch slice off top of bread; reserve. Remove bread from inside loaf, retaining a 3/4-inch shell. Cut bread from inside loaf into bite-size cubes; set cubes aside. Pour cheese mixture into bread shell; replace top. Wrap bread in foil and place on baking sheet. Bake in preheated 350°F oven 60 minutes or until heated through. Arrange heated loaf and bread cubes on large serving platter. I love spinach dip, too, Amanda! I used to make the Knorr spinach dip recipe back in the day – that recipe may be what you’re remembering. However, this one sounds equally delicious. I just might give it a try for our pre-Thanksgiving dinner nibble. 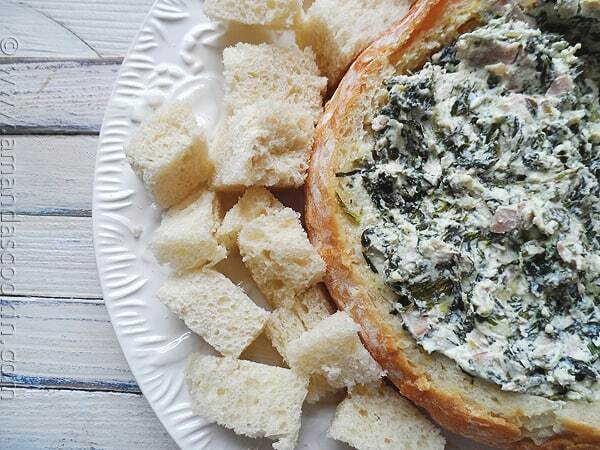 And I love ricotta spinach dip too!